And bonus points for it being summertime down under so we get to use freshly picked kale and bok choi from our garden. Our vege patch that was looking so woeful last year is going gang busters this year! Eagle-eyed readers / noodle aficionados may notice that I have called this dish Miso Kimchi Udon but the noodles pictured are actually buckwheat soba noodles. We usually have it with the plump chewy udon noodles but the night I instagrammed it I had run out of udon so we used soba noodles instead. 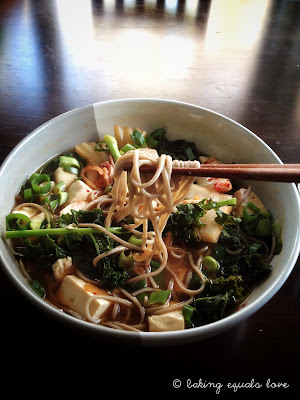 It's delicious with either or you can use any noodles you happen to have in your pantry - even ramen! 1. In a small saucepan cook the udon or soba noodles in boiling water to the packet instructions. Drain and set aside. 2. In a separate large sauce pan over high heat bring the water, ginger, soy, mirin, sugar and dashi to boil. Lower the heat to medium and stir in the miso paste. Add the kale, bok choi, kimichi and tofu. Cover and simmer for around 3 minutes until the vegetables have softened.